I met Andreas a few years back in Bergen, where I had a short stop on a work trip in Norway. He’s a sailor, a marine biologist, a diver and a dreamer. The kind of person who’s not afraid to jump in the water with orcas (only friendly ones, he says, marine biologists can apparently discern these things) or sail his boat among Greenland’s icebergs – all the while making you stretch your ocean dreams a bit further too. And ever since I met him I’ve been begging (and grossly overstating my galley cooking skills) to join one of his sailing expeditions on his sailboat, Barba. Maybe it’s his Viking blood, but the captain is not what you’d call a Sunday sailor. He likes the challenge of the North Sea in his backyard. He sets out for places like Iceland and the remote Norwegian island of Jan Mayen (last year’s trip). And this summer he finally said yes, I could join the next adventure, so I flew to Stavanger, Norway to meet him and the rest of the crew (three awesome Norwegians – Henrik, Jon and Arne) for a trip to the Faroe Islands via the Shetlands. Ever since I spent time in Hamburg several years ago, I’d developed a fascination with making an ocean crossing. In that port city, just the sight of the container ships arriving at the docks along the Elbe River with their low engine rumble and mournful foghorns made me dream. Who was working on these boats, what were they carrying and where were they coming from? It was pure envy on my part. I wanted to cross a large stretch of ocean. I wanted to feel the distance that a jetliner racing through the night from the US to Europe and sleeping pills only dulls. I’d been above the clouds many times, I wanted a low and slow arrival over water, I wanted to make it last. I wanted to see nothing but the sea around me. And I always thought my first time would be on a container ship. But this proposition was far better. We left from Stavanger, a pretty coastal city in southwest Norway, at 9PM, the sun still lighting up the sky and glinting off the modern angular buildings that scream wealth and comfortable living in Norway’s main oil hub. 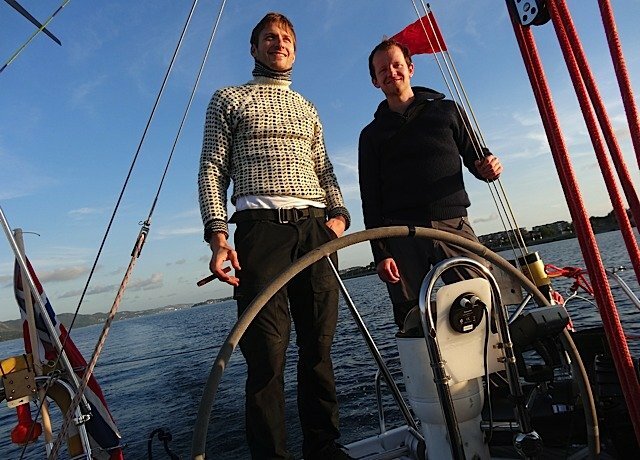 In Kvitsoey, an island about three hours sailing time from Stavanger, we stopped for the night. In the morning there was the smell of sheep atop the lighthouse hill and views of rolling green hills and tidy white holiday houses where children with straw colored hair played. We made our first dive nearby at low rocky islands with curtains of orange sea lettuce strung from their walls and crabs and scallops hiding under waving pieces of seaweed or in the sand. 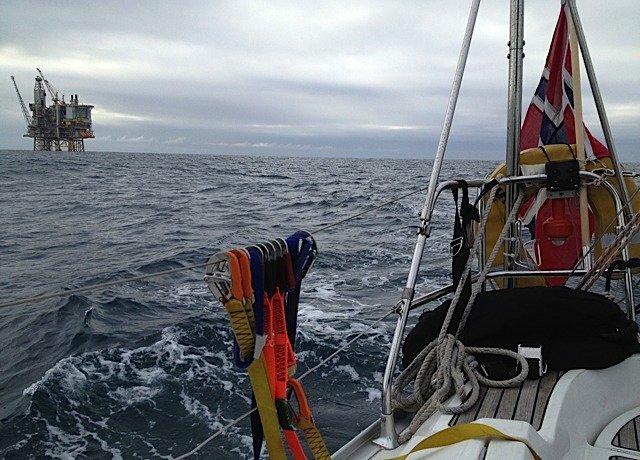 And before the gear was dry from our dives, we were out on the open ocean sailing toward the islands of the Shetlands in Scotland. With the sails up and the boat in motion, I had about half an hour to enjoy the feeling of the land growing distant. The feeling of being a toy pushed across a great expanse of water. And then it kicked in. I’ve always loved the ocean, but it hasn’t loved me. And the seasickness brought me to my knees and hanging over the side as the waves rushed toward my face and things rushed out, and ultimately I rushed into my cabin for the rest of the day and endlessly sunlit night. My own actions encouraged one of the other crew members to join the party, such is the chain effect of seasickness, and we joked we should have had a photo moment capture both of us hanging simultaneously there off starboard. Thankfully, by the next day it was gone. And I finally got to settle into the feeling I’d wondered about. Of being far away from everything and everyone on land, and of not wanting to be anywhere else but there and then, afloat and moving slowly and steadily in one direction with no intent to backtrack. The oil platforms far off the Norwegian coast came into view and finally left it, too, strange alien cement and steel structures surrounded by all that gunmetal grey ocean. More lives on the water to imagine. Then it was just us again. And the sea passing under Barba, sometimes causing her bow to hit hard back on it but always moving on. Just knowing that this boat was our island, our life raft, that there was everything on it we needed to survive, was a feeling I’ve never had. Rather than helpless, as I perhaps imagined it would be, the feeling was purely empowering. The next morning the Shetlands finally came into view, sheer cliffs topped with green and one particular point flooded with gannet birds diving from high and tucked into ledges, their noisy sounds and organic smells mixing with the unmistakable scent of land. And land, oh land. It definitely feels like some kind of reward, even after just these two days at sea. A hot shower in a room that doesn’t move, lunch on the boat when it’s not rocking, and an Indian restaurant everyone’s been raving about luring us out tonight for a feed. But already I’m excited at the thought of setting out again for the Faroe Islands. It may sounds cliché, but there’s no denying that this feeling of being away from it all and on the ocean is even better than I imagined it would be. Terry, this is awesome and brave of you! I am sure I would have joined you both hanging off starboard too. I look forward to hearing more about the next phase of the voyage. A beautiful post, as always. Terry! I’m so glad that you wrote about this, I felt like I was aboard the Barba with you! I hope that the second chapter of your voyage goes smoothly and look forward to reading the follow up. Useful details. Hope to notice more excellent posts down the road. When I grow up, I want to be Terry Ward. Nice sweaters. Did their girlfriends sow them for the trip?